More of a Walking Dead Easter Egg than a fact, but interesting either way! Not only do Walkers rot over time, but the show’s main logo does too! Compare the show’s opening to the first season and you’ll notice that the main title sequence is getting darker, grimier and more decayed over one season to the next! Here’s an interesting Walking Dead zombie fact – in the fictional world of the show, Walkers outnumber humans by a shocking count of 5000 to 1. It looks like Rick and co are going to have to start reproducing and wiping out those Walkers a lot quicker! Remember when Merle was shooting from a rooftop back in season 1? Believe it or not, nearby citizens called the police thinking it was a real gunman! They had no idea that a TV show was being filmed. The SWAT team soon arrived but thankfully no one was arrested. That’s right! Walmart sells an officially licensed prop replica of Daryl’s crossbow! Heck, we’ve even listed it as one the best Walking Dead items to get your hands on! Remember, it’s only for roleplay – there aren’t any walkers in real-life to kill! 6. Daryl Doesn’t Exist in the Comics! Did you know that fan-favorite character, Daryl Dixon was created specifically for the show? He doesn’t exist in the comic books. Norman Reedus originally auditioned for the role of Merle. Although Michael Rooker got the part instead, the writers decided to keep Norman simply because they were so impressed by his performance. That’s when the birth of Daryl happened. Ever wondered why Michonne was kept in the shadows and dressed in a dark cape when she stepped onto the scene at the end of season 2? It’s because the actress hadn’t been cast yet! The cast that play Rick, Maggie and the Governor are more than just talented actors! They’re great at putting on accents too! Andrew Lincoln, Lauren Cohan and David Morrissey are all British! Who would have known?! Playing the role of a Walker sure looks fun, doesn’t it? These actors have to go to “zombie school” to learn how to walk and move before being cast as one of the dead. They are told to stay absolutely silent and not blink at all. The executive producer has revealed that the ideal Walker actor should have big eyes, a good bone structure and a long neck. Those croaky Walker sounds are actually added in post-production. Want to ace that Walker way of walking? These Walker actors are told to move as though they are leaving the bar at 2am. Now THAT sounds easy! Vegetarians – do not apply for a role on The Walking Dead! Ever wondered what those Walkers are really eating as they rip through human guts on the show? Ham soaked in vinegar! They used to smother ham in barbeque sauce in previous seasons but they soon switched up the ingredients because it wiped all the zombie makeup off. The actor who played Dale, however had special treatment because he was such a cherished character in the series. His “body parts” were made of all white meat chicken breasts! Barriers aren’t only built in the show to protect the living from the dead, they’re also built behind the scenes! There are separate eating areas for the living and the dead backstage! Apparently, the producers of The Walking Dead want the Walkers and humans to distinguish themselves as “humanly” possible, even when they’re not working! Is this a case of discrimination?! 12. Chandler Riggs Really Did Eat That Pudding! Here’s a cool Chandler Riggs fact! 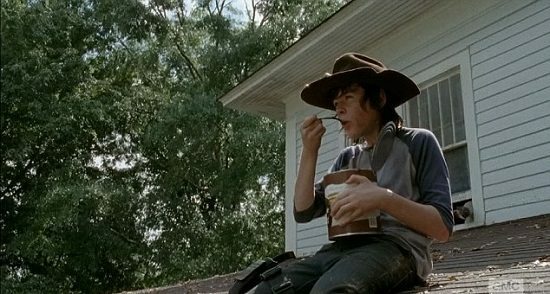 Did you think he pretended to eat that 112 ounce can of pudding back in season 4? In actual fact, Chandler ate it in real life! He admitted that it was his favorite scene although after finishing it, he “absolutely hated pudding”. 13. His Stunt Double is a Woman! 14. There’s a Breaking Bad Easter Egg! There’s a Breaking Bad Easter Egg in The Walking Dead! Walter White’s meth makes a brief cameo appearance in The Walking Dead! In episode 5 of season 1, Heisenberg’s Blue Sky is seen in Merle Dixon’s drug stash! See our list of more mind-blowing things about Breaking Bad, to be super-shocked! 16. The Show is Different to The Walking Dead Comics! The Walking Dead may be based on comic books but the television series doesn’t stay true to them. For instance, in the comic, Merle, Daryl and Sasha don’t even exist! Rick loses his hand, Sophia is adopted by Glen and Maggie and Andrea is alive and hooking up with Rick! Now there’s a world we never imagined! Read about the other differences between the show and comics in our list! You know what they say, “If Daryl dies, we riot”. You know what we say? “If Carol dies, we also riot!”. Thank goodness the show didn’t kill our favorite character off back in season three. Apparently T-Dog was never meant to die. Carol was the one to get bitten, but T-Dog was sacrificed instead as he wasn’t a popular character. 18. The Special Effects Are Awesome! You may feel stupefied and zombfied after reading these facts about The Walking Dead but we’re sure you’ve gathered up a lot more knowledge about the show than ever before! You can proudly call yourself a Walking Dead genius! Want to have a laugh? Check out these hilarious Walking Dead jokes – they’ll make you laugh your guts out!